The window is actually a bay of 3 windows. To make this exposure more suitable for plants, I simply extended the sill and installed glass shelves. And for the enjoyment of trailing plants, I mounted a pair of old, cast-iron brackets to each side of the center window. Such ornate brackets were common in the late 19th- and early 20th-century. 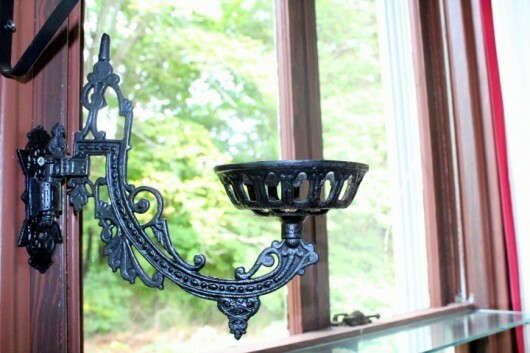 They were intended to hold kerosene lamps. And please note: You don’t need a bay window in order to make a garden! You can attach glass shelves (and brackets, if you want them) to any ordinary window. Just follow these easy directions. To create a September “Still Life with Plants,” I placed a pair of philodendron in the bowls of the lamp brackets. 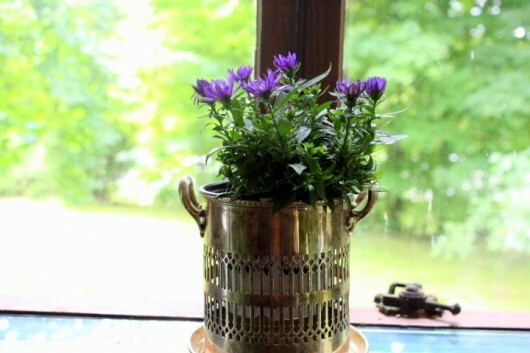 Then I set a small, purple aster in a pierced, silver wine holder, and placed it on the top shelf of the center window. 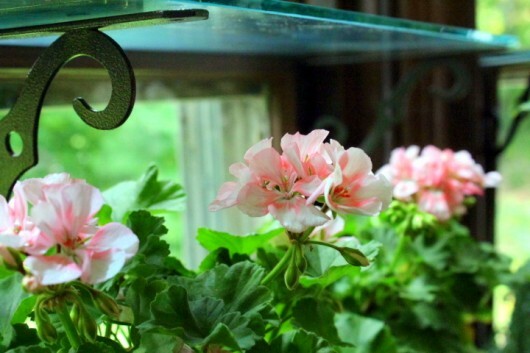 A charming trio of apricot-brushed white ‘Barlett’s Beth’ geraniums (Pelargoniums) went on the shelf below. Unfortunately, this arrangement didn’t ring my bell. Thus I re-arranged the plants. It’s fun to move pots around until you find an arrangement that floats your boat. The arrangement I produced for the broad sill definitely did not float my boat. Why? Because a bunch of little pots in a big space does not make a strong anchor. Consequently I ran to my favorite farm store, and returned with a couple of big, orange-ish chrysanthemums. I placed them on either side of a tall, white-flowered Crown of Thorns. Unfortunately, my biggest jardinieres were not big enough to hide the mums’ black plastic pots. I do not permit plastic in any of my window garden designs. Not exposed plastic, anyway. The remedy? A pair of Rabbitsfoot ferns! These gonzo-size plants came from little divisions I made last October. Once the sill situation was solved, I realized the center-top shelf looked a little…naked. But I did not have more plants to place there. And furthermore, two shelves featuring three plants seemed a little redundant. A pair of silver candelabra! To my eyes, the candelabra echoes the silver wine holder on the shelf below. You might have a different opinion. And Rabbits foot fern (Davalia fejeensis). Folks, I don’t mean to shock you, but these are not my only houseplants. Under the fluorescent-lit shelves in my writing room are petunia cuttings, geranium cuttings, and oodles and oodles of African violets. I’ll show you the violets when I arrange them in the bathroom window garden. So stay tuned! Meanwhile, mind telling me how your own houseplants doing? I hope you’ll drop me a line in the comments field below. 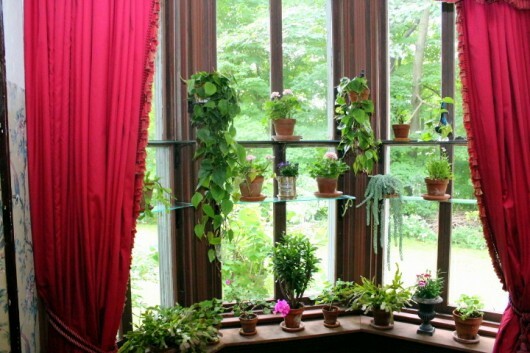 I love your window garden and am thinking of adding glass shelves to a window in my house. 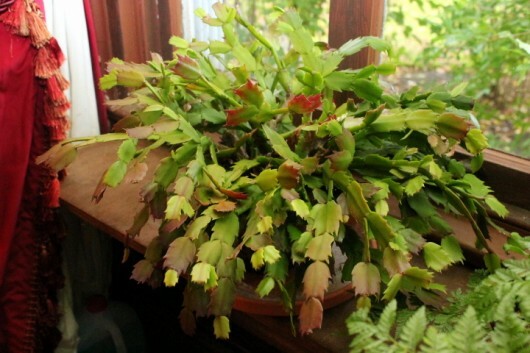 My favorite houseplant is a Christmas cactus that I inherited from my Grandmother, it is about 60 years old and blooms every December/January. It is in a 10″ pot and I am always looking for a good way to display it while giving it the correct amount of light. 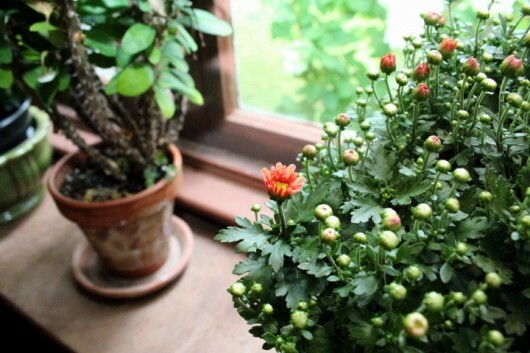 Your window garden is beautiful and your plants look so healthy! I am green with envy! I just walked back into the house after finishing Flora the scarecrow to fix lunch and thought after lunch I would repot my geraniums using your method. I checked my emails hoping your Sunday email would be there and to my delight there it was ready for me to read. I thought what a coincidence your were sharing with us your houseplants brought inside which is what I was planning on doing this afternoon -great minds think alike. thank you for your great blog. Hi, Kevin. Love, love your window! I have two big East windows and a lot of houseplants that are coming in off the porch soon. I really like the idea of the glass shelves. 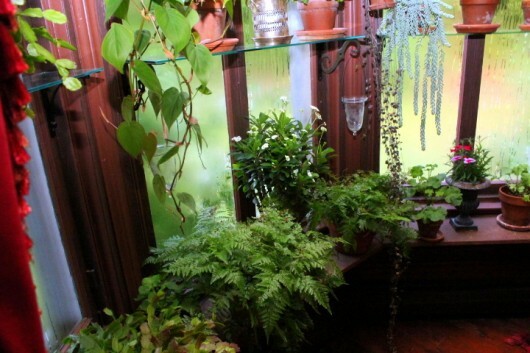 Now I will be rushing out and getting some of those and installing at my windows for the smaller house plants. 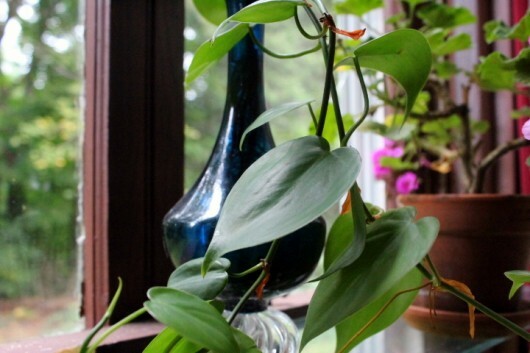 Thanks so much for the inspiration and the lovely pictures of your own house plants. We have an old 1880 Italianate Victorian with no window sills. The builders put in wonderful pantries (3! ), closets with all kinds of built-in shelves and drawers in the bedrooms, but no windowsills. And there is no flat part of the window surround on which you could attach a shelf. (There’s only about a 1″ trim piece that meets the outside moulding, which has no flat part at all.) My solution is to put plants either on the floor (palms, for example) or on Victorian plant stands (ferns are wonderful) if they’re too short to go on the floor. 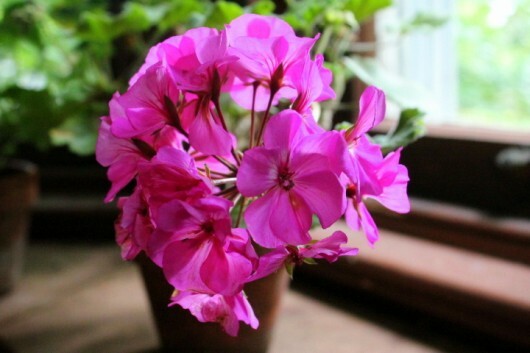 Hi Cilla – In the case of geraniums, I always cut the large subjects down to size, by removing a certain amount of roots and top growth (details here). Otherwise, I don’t let anything that doesn’t look “decorative” into the house. I guess your mom and I think the same way! thanks for sharing your window! The candelabras were a lovely addition. I have been adding colored glass items like telephone pole insulators in various shades of teal amongst my violets. My concern about bringing in my geraniums is that I want to avoid bringing in those little aggravating “fruit type” bugs. 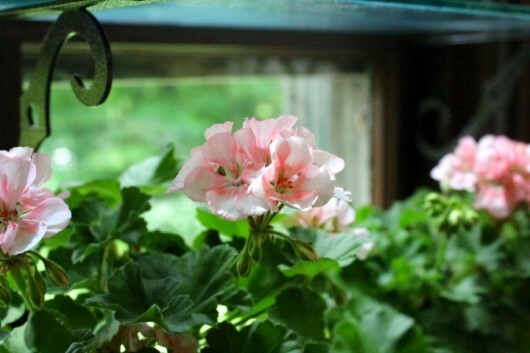 Do I need to transplant the geraniums to new soil or do you have a solution? Thanks and happy indoor gardening! Went back to your Aug 13 post and answered a few of my own questions! Every year I have big Boston ferns on my porch. Do you have any suggestions for bringing them in? It’s hard keeping them hydrated and I don’t have a bath that they will fit in. 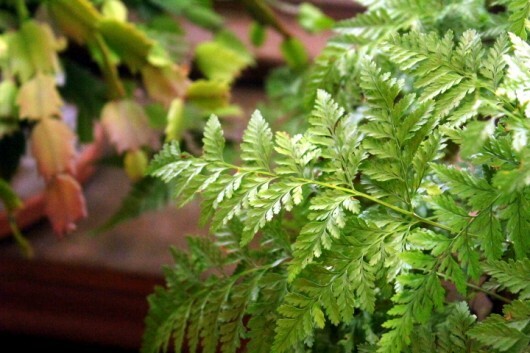 Hi Susan – I overwinter my Boston ferns, but not as huge plants. I divide them into tiny, easy-to-manage, will-fit-anywhere-ferns. Here’s the how-to. Thanks, Kevin! Fantastic idea and then I will have room if I tuck them here and there, can bring one to my Mom and send some in to my daughter’s Kindergarten classroom for the kids to watch. Hi Carol Snyder – So glad you enjoy this crazy website. I bring my plants indoors when nights regularly dip below 58 degrees (temperatures here plunged to 42 the other night!). First, acclimate the plants, as described in this old post. Today I potted up cuttings for black Coleus ‘Palisandra’ which, if it makes it through the winter, will be the third season I have had this variety just for the price of a seed pack. I also potted a maroon and chartreuse Sweet Potato Vine going into its third winter. I have to dig up my Bay Tree to come inside plus two monster Fig Trees, one white and one Chicago Hardy (brown). These 3 will be living in our attached garage in their semi-dormancy. I must also dig up my Aeonium and find a nice decorative pot. The Jade, red Hibiscus rosa-sinensis and Stapelia (Starfish Flower Cactus) are coming inside soon. Oxalis ‘Purple Shamrocks’ were potted last week and are sitting with the Streptocarpus to remind me to bring both in shortly, too.The table tops and shelves all look different around here just before frost hits with a lovely reunion of houseplants. Its a little sad and a little exciting. Kevin, you are so inspiring. I am going to work that onion dish into my menu this week. Looks so good! 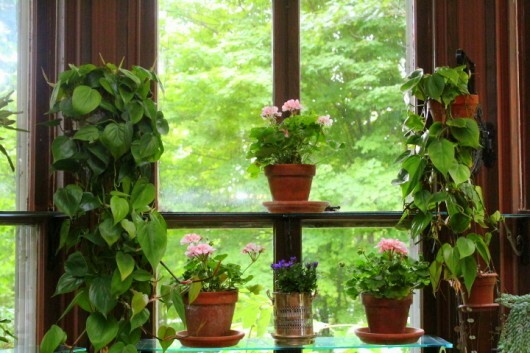 As soon as I am retired and have more time, I would love to set up the window garden. I have been growing plants for my entire life. I have two square foot gardens and four houseplants at the moment. Sixty years young and still working as a Montessori teacher at the preschool level. Looking forward to more time end energy when I am at home all day and can happily go from kitchen to garden all day long 🙂 Thanks for all your wonderful ideas! I love your garden windows. I have lots of house plants in my “porch room”. My home is over 100 years old and very Victorian. Our “porch room” was originally a screened in porch. Now we can use it year round. Since it faces E & S, it is prefect for lots of plants. I’m now also in to African violets which are front and center of the front window. Thanks for all of your wonderful ideas. Keep them coming. I hope that you have glass or something other than plain wood on the extended sill. I have had pots in windows or on wooden surfaces and they have been ruined. a Glass top or ceramic might prevent that from happening. Then again, you are no doubt a lot more careful than I probably was! Kevin, Thanks for the pretty window view. 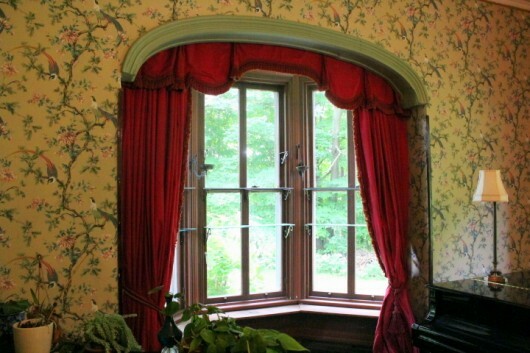 Reminds me of my MIL’s windows. 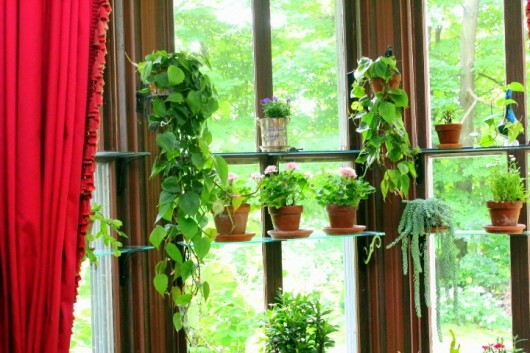 Could you please tell me if that plant on the right side of the window (2nd shelf, 3 plant in) is called a Rosary Vine? My mother-in-law had one years ago until I over watered it. I’d like to get one again. Also, where did you get a white “Crown of thorns”. MIL had a red one that was another of my failures. Shame on me, she never got mad about the death of her flower babies. What a beautiful and inspiring display you have. Thank you for taking the time to share it with us. I am intrigued by the idea of bringing dianthus inside. I’ve never seen that done before! I have a few in a border and love them. I never knew they could be brought inside to overwinter. Is there a trick to bringing these beauties inside? I am grateful to have a wall of windows that are south facing. They provide enough sunshine to keep a Meyer lemon and large bougainvillea happy all winter. The gorgeous scent of dianthus in February could possibly get me through March. Any tips would be most appreciated. I just love your blog! 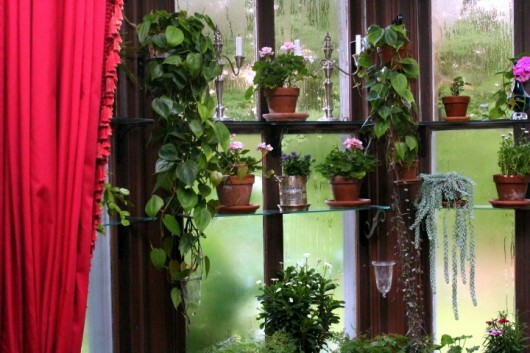 Hi Joanne – Yes, the long vine in the tiny hanging basket is “Rosary vine”, or Ceropegia woodii. It grows and grows with only minimal care. I need to cut it back — it’s pendant stems have grown so long they are touching the floor! 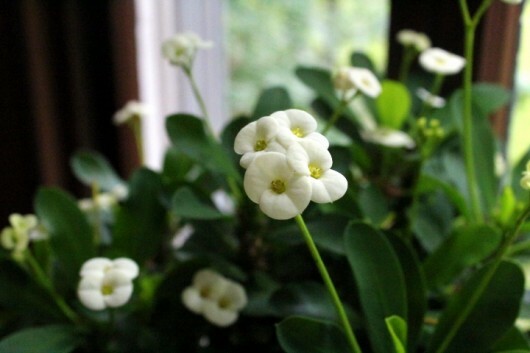 I can’t remember the source of my white Crown of Thorns, but I’ve had the plant for many, many years. 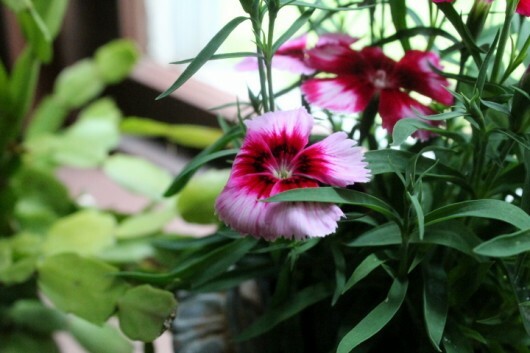 Hi Chris – Dianthus is one of my “trial” houseplants. I’ll let you know how it fares. Love Meyer lemon, and especially the flowers that emerge in the window garden starting in late December. What a scent! I am a HUGH fan……love the newletter, website, etc. I do so love your Window Gardens! But I have trouble keeping my house plants health looking, and could certainly us some advice on ones good for winter house display. I have a bow window similar to yours but by the time the heat comes on in October they begin to look droopy. Help! I wish my kitchen window were not on the north side of the house, as i’d bring in herbs for the winter. 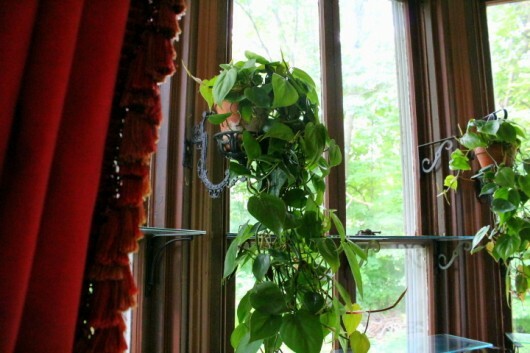 My south-facing bay window is a death chamber for plants, as I have to close the blackout drapes to watch television and I forget about the plants behind it… If it weren’t for rain, my outdoor plants would probably die from lack of watering, too. I love love LOVE your blog, which is why I’m taking the time to let you know about this tiny formatting issue when it’s viewed in The Old Reader. There are no pictures and no paragraphs. It’s just one big huge block of text. The sad result is that I sometimes scroll past it without really getting all the meat. I know the picture thing may be beyond your control, but the other bloggers I follow have paragraph breaks, so that may be something you can tweak. Again, love love LOVE your blog. You are awesome! Heidi – What’s The Old Reader? Interested to see you have Crown of Thorns. How do you care for them. Mine are reluctant to bloom. 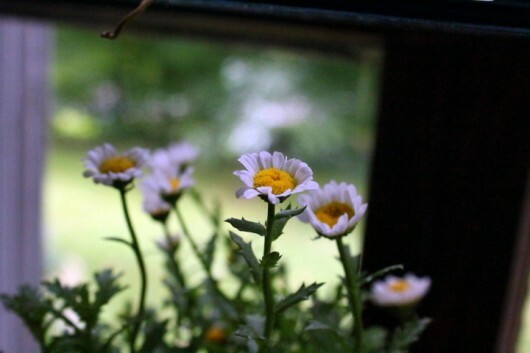 For some years I had two plants that flowered all year long – eventually got too old. Didn’t think new plants would pose a problem. Mine always been red – never seen white. Kevin, the window is beautiful. You always inspire me! 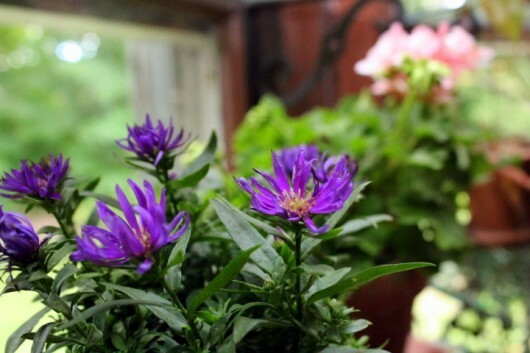 As a Master Gardener, I am especially enjoying this article. 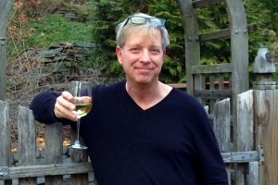 Your plants look great and show your love and care….Kevin, you are a hoot and it gives me pleasure reading your blog. It was fun to watch you go through the arranging process. Also– the window is lovely! The window looks lovely. 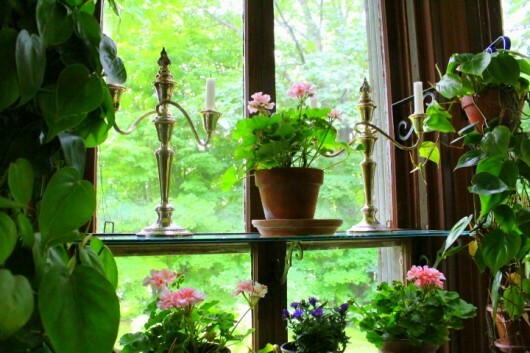 I am inspired to create another window garden in my own house. BTW, what direction does the window face that you just filled with flowers? 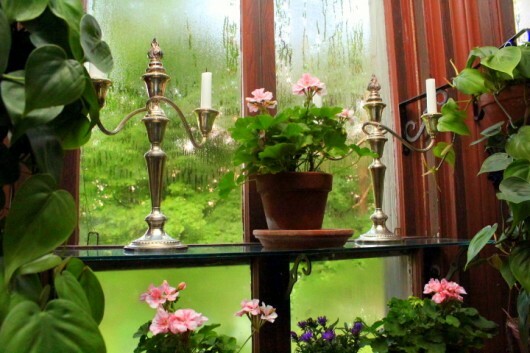 I have only a North and a South window available for plants and previously, plants haven’t done very well in my N. windows, especially in Winter. Hi Naomi – The window pictured above faces south, while the window in my upstairs bath (pictures here) faces east. Once the deciduous trees drop their leaves, both windows receive full, unobstructed sunlight. 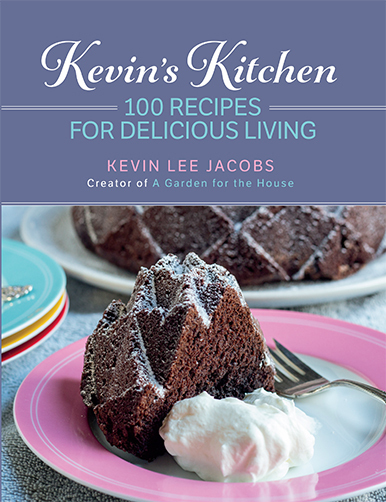 Hi, Kevin and Friends……..Well you certainly have inspired a lot of us to purchase glass shelving and take cuttings from the petunias and geraniums!! What a following you have…….I have tidied up my computer room..purchased a new low filing cabinet to get rid of clutter…..my husband put up the shelves and even added an extra strip down the middle for 3 supports across. I went to the second hand store purchased some lovely clay pots of all sorts and forms……..The cuttings are now in these waiting to be carried upstairs from the garden….then for the arrangement!…..Can hardly wait to add extras plus a scarf valence to softly frame the shelves! Winter will be a little different this year!….thank you! Kevin : You definitely have a talented , imagination!!! I am getting there. I do enjoy your photos of foods and houseplants!! You see I am a ” foodie , at heart ” I worked in middle management for the better part of 20+ years!!!!!!! After that career , I was burnt out on management and choose to work the other side of the service industry , as a waiter. No more headaches to deal with , just a few cranky customers every now and then!!!! Made a first attempt at growing dahlias this year. Beginner’s luck – I actually had several beautiful dinner plate sized specimens and am now hooked on these glorious blooms. Unfortunately a window-rattling thunderstorm devastated most of the plants. Next year I’ll do a better job of supporting them. I have a question, please, Kevin. Do you know why the cussed squirrels are eating my geranium plants? They chew the stems like a beaver bringing down a tree. I’ve trained a few specimens into a tree form but this afternoon found that every one of them has been chewed up. but the low bushy forms are equally devoured. Any hints to thwart these fuzzy tailed rats would be sincerely appreciated. I’d like to know what kind of plants you think will grow in my tiny dining room with one window that faces east? I have had success with an asparagus fern (the kind that looks like a forest) and a tree, who’s name I can’t remember, my coffee plant has survived two years, just barely.Any adivice from you would be great!